Her byline pops up now and again in the opinion pages (supporting McCain, bashing enviros). She periodically hits the campaign trail with favored candidates. She is a prolific and passionate tweeter. Her Facebook page overflows with thoughts on global events both past (DDay, Reagan’s Brandenburg Gate speech) and present (Israel, border security, the need to drill, baby, drill); news of upcoming appearances (a rally at the Lincoln Memorial with Glenn Beck, a possible U.K. jaunt to meet Margaret Thatcher); the latest media atrocities committed against her; and her rolling endorsements of “commonsense conservative” candidates who tickle her fancy. And, any day now, filming is scheduled to start on the docu-travelogue series in which Palin will “bring the wonder and majesty of Alaska” to TLC viewers. 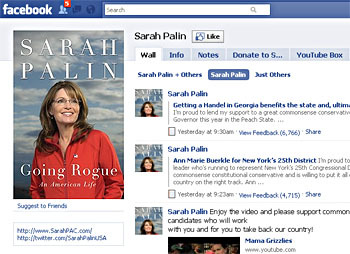 In the midst of this aggressive visibility, however, Palin keeps a tight grip on her time in the public eye. She rarely sits down with non-conservative interviewers and eschews mix-’em-up formats pitting her viewpoint against that of a more liberal counterpart. ….It’s an unconventional media strategy, to be sure….Yet it’s hard to deny that Palin’s p.r. approach has not only succeeded but succeeded brilliantly. How? The most obvious element at work here is that Palin operates not as a politician but as a celebrity. “Most politicians can’t get on the cover of People,” sighs another GOP campaign veteran. “She’s on the cover almost every week.” The rules are different for celebrities: Palin’s megawattage enables her to command attention for every word and gesture, even as she largely stiff-arms The New York Times and “Meet the Press.” Similarly, candidates desperate for her endorsement are unlikely to (publicly) whine about whatever attention she dribbles their way, no matter how arbitrary or last-minute. Palin is, in some sense, sui generis. And yet, I wonder if her press strategy is really such a unique consequence of her celebrity-hood or rather a sign of things to come? There’s no question that she’s pulled off her particular schtick better than anyone else in American politics, but there are others who have gone a ways down this road too. One is Barack Obama, who restricted press access to a startling degree during his presidential campaign. Keeping presidential campaign reporters on a tight leash is a trend that’s been building for years, with every campaign more tightly controlled than the last, but still, Obama pretty clearly took this to a new level. The other example who comes to mind (since I live in California), is Meg Whitman, who just ran a high-profile primary campaign in a big state with virtually no interaction with the mainstream press. She gave speeches, she ran ads (boy did she run ads), and she spoke to friendly reporters occasionally, but that was about it. And guess what? It worked. She proved that you really don’t need the press anymore to run a successful campaign. Now, obviously there are some catches to all this. Obama, like Palin, had a strong aura of celebrity that he could milk. And Meg Whitman has untold riches to spend. Your ordinary schmoe candidate in a smallish state or a single congressional district can’t count on either of those things. Still, I’m putting my money on the Palin-ization of politics. Partly this is because the mainstream press is dying anyway, and partly it’s because Palin and others are demonstrating that you really don’t need conventional press coverage to win. In fact, as Rand Paul and Sharron Angle can testify, it’s a real risk. Between YouTube and Twitter and Facebook and blogs and friendly talk radio hosts — as well as more conventional things like TV ads and database-driven phone outreach — who needs the New York Times? Increasingly, I’ll bet the answer is, no one. Does Sarah Palin Not Read the Newspaper?